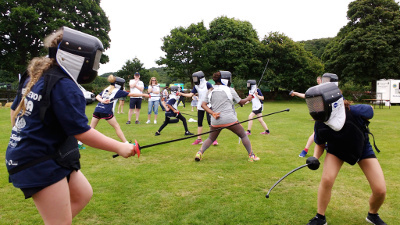 West Devon Swords will be at Okhampton Sports and Fitness Festival’s Super Sporting Funday on July 16th at Simmons Park. We’ll be there with plastic fencing for the juniors and the chance to try some historical swordplay with longsword and rapier. “Great chances to take part in archery, fitness sessions , swims, tennis, putting, fencing, runs or walks, badminton, table tennis, putting, trampolining and even a climbing wall- all at Parklands or with us at OCRA .